The campout will take place at the flagpoles at the center of campus near the Lee Honors College from noon on Monday, February 26 to noon on Wednesday, February 28. The community can visit the campers, learn more about Habitat for Humanity, and, of course, make a donation. Campout donations can be made on behalf of ATΩ by credit card at www.habitatkalamazoo.org (please enter “ATΩ” or “Campout” in the appropriate box). Checks made payable to Kalamazoo Valley Habitat for Humanity, with ATΩ in the memo space, can be mailed to Kalamazoo Valley Habitat for Humanity. 1126 Gull Road, Kalamazoo, MI 49048. Donations also can be dropped off with the students on the WMU campus during the campout. 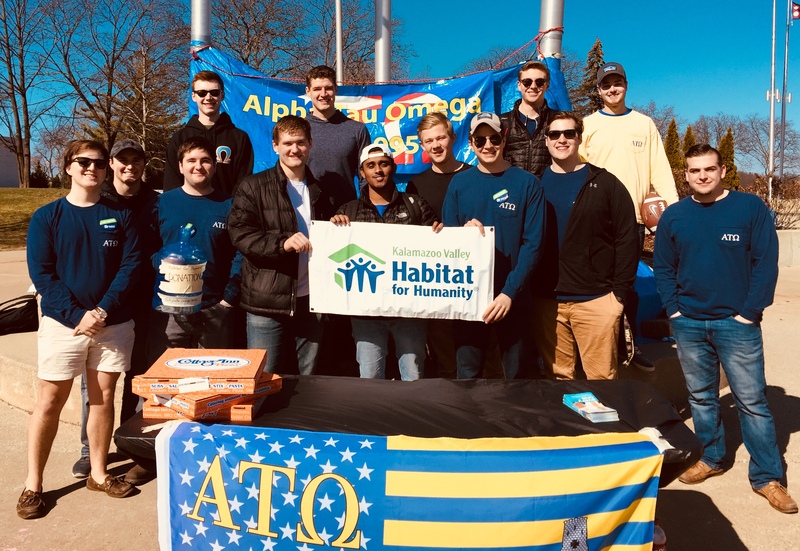 WMU’s ATΩ chapter started the Campus Campout in 2003 to raise funds to support the volunteer efforts of the ATΩ members and WMU students with Kalamazoo Valley Habitat for Humanity. The WMU ATΩ chapter began in 1995 and currently has just over 60 active members.